Political and military history of the Late Roman empire. All the emperors and battles. This part of Fectio features a growing section of articles about Late Roman material. Here can be found articles about the sources, use and construction. The image shows the surviving cast of the funeral stone of Lepontius. 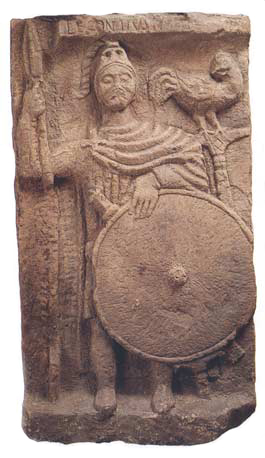 This Late Roman soldier most probably belonged to the 8th Legion and was stationed at Strasbourg. This page is about making a plumbata. The construction stage by stage. An article by Ros Ereira about the construction of the draco for the Time Team. An article by Tim Blades about the construction of the head of the draco for the Time Team. An article by Peter Taylor about investigating the noise of the draco for the Time Team. This page is about making a basic item, the shield or scutum. We show here the construction of a flat shield, stage by stage. An article about the strength of armies and units in the Late Roman army. An article about hierarchy in the Late Roman army. An article about the Late Roman elite units who succeeeded the Praetorian guard as palace guards and elite units in the field. An article about the possible weapon used by Arrian's heavy legionary infantry in his 2nd-c. treatise. An article about testing the plumbata. Tests of 3 different types in 2007. Testing Plumbatae (2) An article about testing the plumbata. Tests of a different type in 2011. An article about this Late Roman battle standard with a lot of images of and quotes from the sources. The text is currently being prepared for publication. This article, translated into English from the original 1986 German article, studies the very complex period of post-Roman Britain. Who wants to be.. a Late Roman? An article about my reasons to do late Roman re-enactment, and the differences with the usual Romans. Published in: Echoes from the past, vol. 8, October 2003.